Picture your trusty old Swiss Army knife for a moment. You know, that red handled, pocket-sized multi-tool you count on to help with everything from cutting boxes open to picking your teeth? Yup, toothpicks come standard on those switch-bladed bad boys! Swiss Army knives are pretty handy because they address many day-to-day problems from a single, multi-functional platform. Imagine if you could advertise and test multiple different opt-in offers on your site - without actually needing to create more than one opt-in offer. Read on to discover a fast-action method for turning your one-trick opt-in offers into conversion focused multi-tools. For Swiss Army knives, the pivot mechanism is the centerpiece that ties all its different gadgets together. When it comes to your opt-in product, the pivot-mechanism would be the method by which you brainstorm and extract the multiple benefits your opt-in product offers. To put this idea into action, we'll show you how to identify those different benefits and then create value propositions around each of them. Once you’ve crafted your value propositions, you can then create opt-in offers for each of them to A/B test with your audience. Peep Laja at ConversionXL describes value propositions as the clear promise of value to be delivered through your headlines, subheads, bullet points and images. And be unique compared to your competition. If you’re successful in crafting opt-in offers that actually deliver good value propositions to your audience, that alone will put you miles ahead of your competitors. To illustrate this particular point, check out this ConversionXL article to see how most online marketers mess up and neglect the value propositions in their opt-in offers altogether. In the book Value Proposition Design, Alex Osterwalder and his coauthors rely on trigger questions to establish customer profiles whenever they create new products. In this article, we’ve condensed their trigger questions into a shorter hit list of prompts showing you exactly how to uncover additional benefits and value propositions in just a few minutes. To illustrate this method with a real world example, we collaborated once again with John Lee Dumas from Entrepreneur on Fire to brainstorm value propositions for his free eBook The 11 Habits of Successful Entrepreneurs (Plus, the first steps to making them habits). 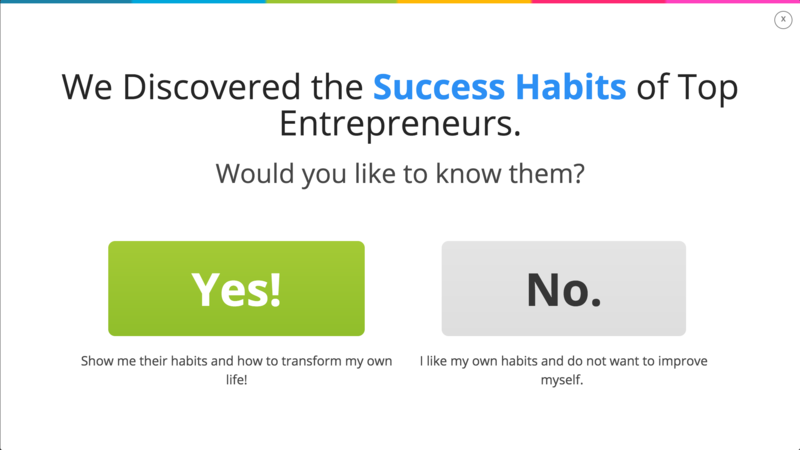 The control offer for 11 Habits of Successful Entrepreneurs. The value proposition here aims to help improve a visitor’s day-to-day productivity by showing them the success habits of their entrepreneurial role models. But there's definitely more value we can try to squeeze out of this eBook offer to see if there's something better the audience will resonate with. If possible, look through your comments and feedback from current users. Record any benefits or frustrations they mention that fall outside your current opt-in offer’s value proposition or acknowledged objections. Use the following pain point trigger questions to help yourself brainstorm audience problems that your product may already be solving, but not aware of. ...anything that annoys your customers before, during, and after trying to get a job done or simply prevents them from getting a job done. Pains also describe risks, that is, potential bad outcomes, related to getting a job done badly or not at all. What’s considered too costly a solution in terms of money, time, effort or frustration? Establishing new habits feels overwhelming and frustrating. People want the results of successful habits immediately, without having to put in the work. People worry that they might have to spend money on apps or coaching to cultivate successful habits. Does your product address missing features or poor performance that competitor solutions don’t? Other entrepreneurship eBooks may describe successful habits, but this free eBook actually shows readers how to get started implementing them. Is there a fear of social embarrassment, loss of face, loss of power or loss of status your product helps solve? Poor habits and lack of discipline keep people from achieving daily tasks. This perpetuates a feedback loop of self-judgement that keeps people from working towards their long-term goals. Bad sleep makes people look, feel and perform poorly. 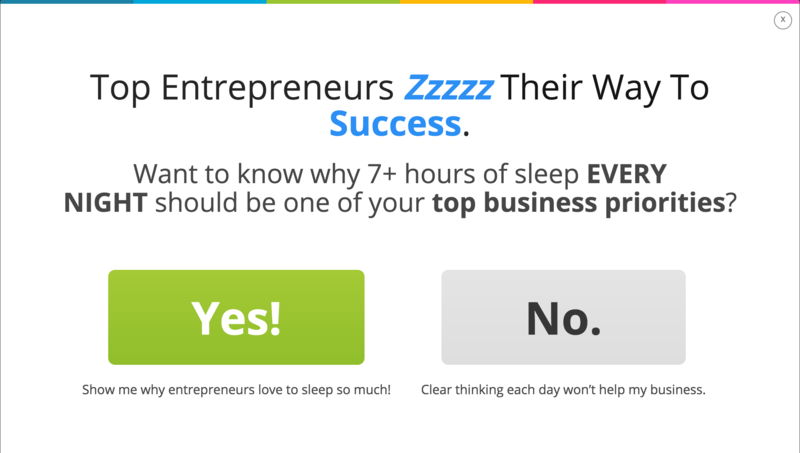 Getting 7+ hours of sleep is a central habit of the free eBook. People struggle with Inferiority Syndrome. They feel like frauds regardless of their skill level or actual accomplishments. Are there any other big worries, concerns or anxieties your audience has that your product addresses? Not being able to get enough sleep. An inability to stay focused in a modern day world filled with attention grabbing distractions. A lack of planning and goal setting skills needed to maintain focus and prioritize the most important things. Like above, use the next set of trigger questions to help brainstorm your audience’s “gains” and desires. ...the outcomes and benefits your customers want. Some gains are required, expected, or desired by customers, and some would surprise them. Gains include functional utility, social gains, positive emotions, and cost savings. How does the product save your audience time, effort or money? The eBook is concise and actionable. Readers can consume and start implementing the habits in just a few minutes. Does your solution provide subscribers with better quality or performance? The free eBook habits and implementation advice will help boost a reader’s daily, weekly and monthly performance. Readers will start accomplishing small tasks daily that will build towards achieving their larger, long term goals. Will your solution make subscribers look and feel better? Achieving more daily, weekly and monthly will make readers feel more accomplished. This will further motivate them towards achieving their long-term goals. Does your opt-in product provide users with additional features they desire or are missing? Most free eBooks don’t offer simple action steps or suggest changing too many behaviors too soon. This free eBook shows readers the first steps to start cultivating these habits of success immediately. Will your solution increase a subscriber’s social status, empower their work, or improve their day-to-day lives? Success in a reader’s entrepreneurial endeavors will bring them greater freedom to work on the projects and with people they prefer collaborating with. Succeeding in these habits and business endeavors will help readers be viewed by their community as important value creators. Does your product address the target audience’s dreams and aspirations? The free eBook teaches readers how to keep perspective and the importance of not giving up. Finally, review your answers and user feedback to see what new kinds of value propositions surfaced. Get better sleep to improve your daily performance. Learn how to overcome Imposter Syndrome. How to avoid squandering time in a world full of modern distractions. How to accomplish more to achieve your long-term goals. From that short list of value proposition ideas, you can now start crafting new opt-in offers around your free product. With your additional value proposition ideas in hand, you can then follow standard copywriting principles to formulate strong headlines, subheads and button copy for your new opt-in forms. SLEEP: Get better sleep to improve your daily performance. IMPOSTER SYNDROME: Learn how to overcome Imposter Syndrome. TIME: How to avoid squandering time in a world full of modern distractions. ACCOMPLISH MORE: How to accomplish more to achieve your long-term goals. We then A/B tested all the new opt-in offers against each other using Thrive Leads to see if any of our value proposition ideas resonated better with John Lee Dumas' audience as judged by conversion rates. The results of the opt-in offer value proposition A/B Test in the Thrive Leads dashboard. Strikingly, the "Accomplish More" opt-in form just about doubled the number of email signups when compared to every other offer! This appears to be a significant and meaningful difference from all the other value propositions tested. 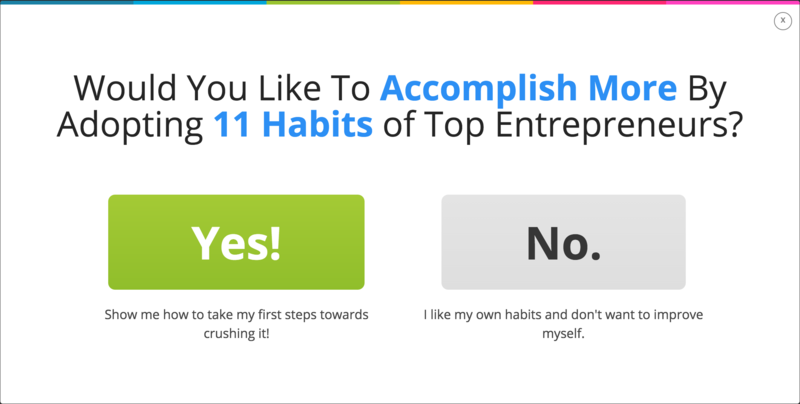 And/or the number specificity of 11 Habits (that was only in the headline of "Accomplish More") somehow enticed more visitors to opt-in. To push past speculation and actually isolate what's behind this particular conversion bump, we would need to dig deeper with another round of A/B testing. Round 2 would aim to separate the specificity element of "11 Habits" from the "Accomplish More" value proposition. However, regardless of the reason, you can now see just how powerful value proposition testing can be for an opt-in offer you're already running. Spending a few minutes to round up user feedback and think deeper about your current opt-in product can yield important new angles to test among your online audience. Just imagine, if you improve your signup conversions even a fraction of a percent with this method, the small amount of time and effort invested would likely result in a substantial increase in sales for your online business over the long haul. And if you're lucky enough to unearth a blockbuster value proposition, not only will you grow your email list significantly, but you'll have learned a powerful new insight about your audience that can be leveraged across all your marketing efforts in the future! Go ahead and take one of your current opt-in offers and try the Swiss Army Marketing Method for yourself. It only takes a few minutes to run through all the steps described above. Even better, if you've got Thrive Leads installed on your WordPress website, you can launch your own value proposition A/B test as soon as you're done. The ultimate conversion optimization lever behind this method is the opportunity it creates for you to learn important new insights about your audience. If you discover something significant, you can use it to improve your future marketing and product development. So go ahead and add the Swiss Army Marketing Method to your online toolkit for creating crackerjack opt-in offers. Let us know if it turned out to be as handy as your trusty old Swiss Army knife in the comments below. Just remember to fold that freshly honed, marketing multi-tool up again before sliding it back into your WordPress dashboard! Certainly makes testing your opt-ins much less daunting! Thanks Gun, I’m glad it helped! Thank you for this. I am in the process of creating my opt in and I was struggling with this process. This came to me at the right time. Happy to hear it was both helpful and timely for you Barbara! This high quality post is what most of us in the know have come to expect from Thrive Themes (& tools). Gold Matt. Seriously, awesome content, and so relevant to what I’m doing right now!! Thank you. Cheers Graeme…so glad to hear that it helped! It looks great. But I personally don’t like these two choice option boxes that force you if you don’t want to sign up to say something like I don’t want to improve. I also wonder if the more stages you have the more likely your sign up person is to give up. I’d rather sign them up and then attempt to engage them in conversation and find out this way what they would like. But I want to keep an open mind so in the future I’ll come back to this again. Okay. I just wrote about some doubts with having a multiple opt-in system and entered my comment. Then I got this series of options about what my biggest problem was. Now that was good. So I really like that aspect of the multi-opt in. So in the near future I’ll try and do something like that. I don’t though like the box at the beginning with the two choices still. I guess in the refusal box I would put something like “Not today, thanks” rather than put words in somebody’s mouth – especially negative ones such as “I don’t want to improve myself”. If you’re interested in learning more about multi-step opt-in forms and the micro-commitment principle behind them, Shane wrote an excellent post about it here. And your point about the “No” button copy is well taken. I would just recommend testing it further down the road when you can afford to conversion optimize smaller levers. 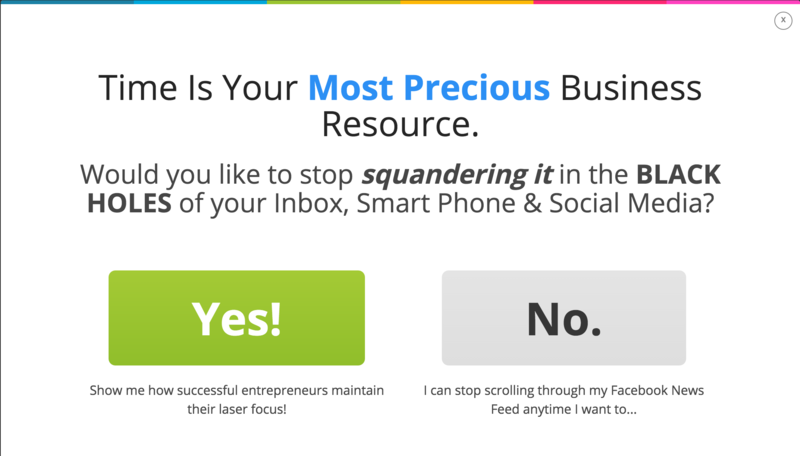 However, I think your suggestions for the “No” button copy are great ones to use and launch your own value proposition test with! This is an awesome post thanks Matt. My team and I can work on the alternative value propositions, but lack the Thrive Leads implementation skills. Very confusing. Can you refer me to someone we can pay to help us execute? So glad to hear that the post was valuable to you and your team! 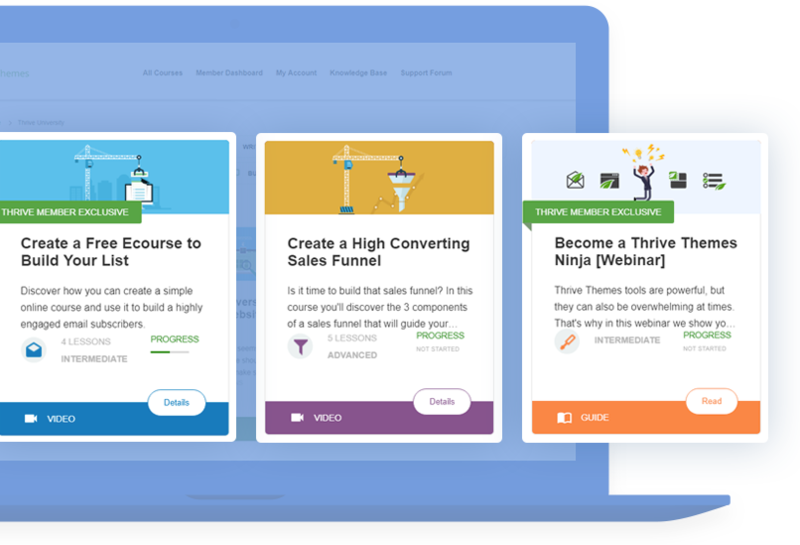 I would recommend checking out the Thrive Leads Section of the Thrive Knowledge Base first to help clear up the confusion when it comes to creating your First Opt-In Forms as well as how to set up Thrive Leads A/B Tests. Great post Matt! I will be now be harvesting and testing Value propositions for my opt-ins. In the example, the only headline that had a real benefit was the fourth version (Accomplish More). It would be worth testing the other value propositions with benefit-driven headlines. Thanks Christian…best of luck testing your new value propositions on your opt-in offers!